So there's the phrase, "What happens in Vegas stays in Vegas." Um, No. These fabulous folks were given fair warning. Here's what goes down in my SDE sessions. Sure, I could post slides and pictures of me...but isn't that more fun? Truth is, I didn't even get one picture of myself all day long. I did get a lot of joy, however, out of sharing with teachers and listening to them as well. Remember if you have any questions about our sessions, feel free to email me. Then there's these two... Laurie and Rachelle from Abilene, Texas were the first teachers to walk into my session 8 a.m Monday morning. They stayed with me all day, right there on the front row to encourage and just down right bless me all day long. We started out like this on Monday... We ended up like this by Thursday! Another privilege for me is working with the fabulous folks at ESGI. 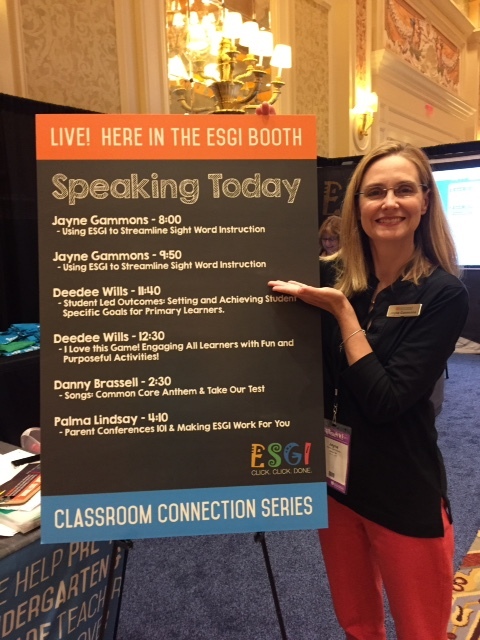 Here I am in their booth talking about the magic of saving hours on your assessments. 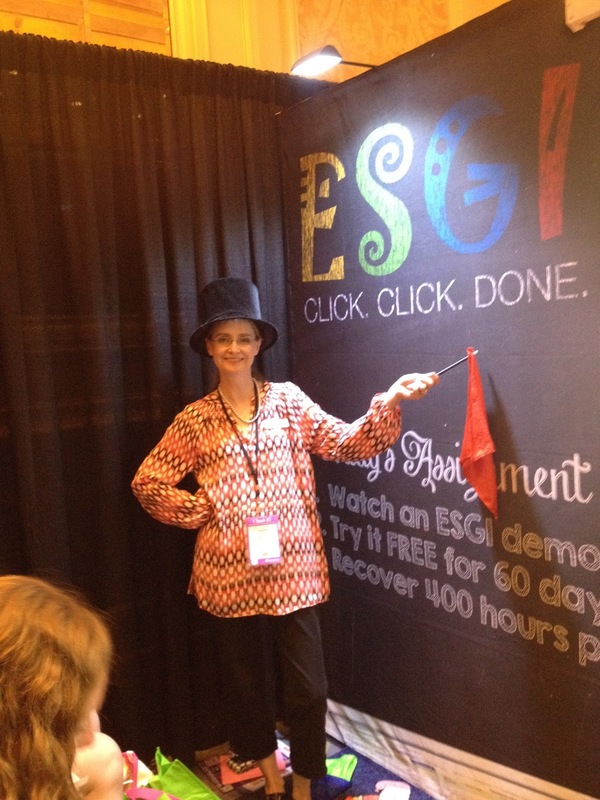 Yes, there is a whole lot of learning going on at SDE conferences. The fun and friendships are the glue that makes it all stick. Be sure to look for a conference in your state this year. Start saving your pennies for the National Conference next July in Vegas! Leave a comment if you went to the conference. Even if you weren't in my sessions, share your fun! I went to the your first session on the first day of conference, and I could have gone home right then and there and felt like I'd gotten my money's worth out of the conference. You really opened up my eyes to the importance of writing with my kiddos on day one and every day. Thank you! Oh, what a wonderfully nice comment! I'm thrilled that everything went so well for you! I always knew you were going to be a FABULOUS speaker! Thanks for including the fun photo with me and Palma! Sure was fun, wasn't it? See you sometime soon, hopefully! Your blog rocks! Thank you for sharing the contest too! I love your blog! I just found you! You have great ideas and materials! Thank you! Enjoyed looking through your blog. Lots of great things to see! We are working on our teen numbers, which of course the majority of my students are not able to master. Your bubble gum activity on TPT looks like a great activity. Do you have any other great classroom tips for teaching teen numbers other than that activity or the teen number songs on youtube I have used. Thanks! This type of meetings are incredible for creative innovation.